Thank you all SO much for helping me get over 30 followers!! In fact, I'm now at 49! WOW!! I promised a giveaway, so here it is!! 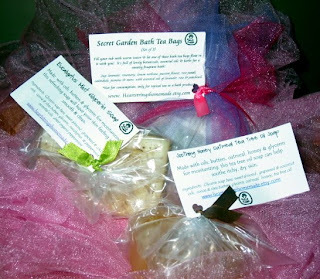 Winner will receive 2 bars of my homemade soap - one each of Eucalyptus Mint and Soothing Honey Oatmeal Tea Tree Oil Glycerin Soaps, and 3 bags of Secret Garden Herbal Bath Tea Bags. The honey oatmeal soap is great for sensitive or dry winter skin, the eucalyptus mint is my favorite winter soap and the bath tea bags are filled with fragrant herbs and essential oils for a lovely bath experience. Sign up to follow my blog via Google Friend Connect, and leave a message saying that you did so (or that you already follow, if you do!) This is mandatory; you must follow my blog for your bonus entries to count in the contest! Blog about this contest on your own blog, leaving me a link to the post in a comment below. Tweet about this contest, leaving me the url to your tweet in a comment below! Visit my Etsy site (www.heartstringshomemade.etsy.com) then leave a comment here letting me know your favorite item in my shop! Giveaway ends October 31 at 11:59 pm. Winner announced on Monday, Nov. 1st! Visited your Etsy shop and I think my fave would be the vanilla buttercream soap... MMMMMMM love the real thing so I bet the soap is dreamy. Oh oh oh, pick me pick me pick me...Already a proud follower. The decorative clothes pins are very cute and unique! I just liked you on facebook too!!! I added you to my favorites on Etsy and my favorite item is the Lavender Peppermint Soap !! I follow you on twitter. How I heard about the giveaway!!! Congratulations on your goal, Aimee!